Order within 48 minutes to receive your order by Monday 22nd April. This stunning sapphire and diamond half eternity ring has been crafted in 9 carat white gold. The ring features five brilliant cut vivacious blue sapphires, each set within elliptical frames surrounded by a dazzling border of brilliant cut diamonds. The plain ring shank blends seamlessly into the flared ring shoulders. This fanciful ring looks great worn alone or layered. The vibrant sapphires are offset perfectly with bright white diamonds. 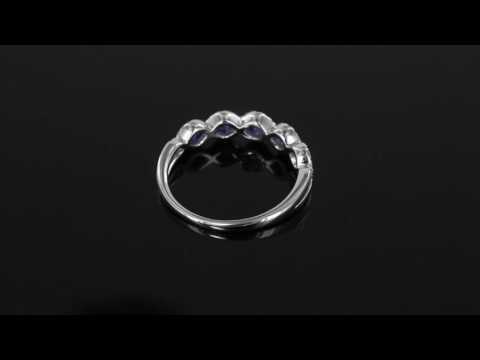 This ring will make for a perfect gift. The sapphire and diamond half eternity ring is available in a variety of ring sizes, please state size when ordering. If you have any questions regarding this ring please do not hesitate to get in contact. Crafted from 9 carat white gold. Set with impressive vivacious sapphires. Clusters of bright white diamonds.